This is a watch based on the Walt Disney classic movie, "Peter Pan". It features Captain Hook in a fighting stance. This watch was part of the Watch Collector's Club Series III. The Watch Collector's Club was a series by Fossil and was made exclusively for The Disney Store. This watch is part of a numbered Limited Edition of 7,500 Watches made. This one is number 3087. 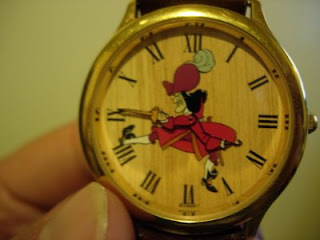 Captain Hook's arm with the sword is the minute hand. His hook is the hour hand.